One secret policeman asks another: ‘So, what do you think of the government’? His colleague looks around before replying, ‘The same as you, Comrade’. Whereupon Policeman No.1 declares, ‘In that case, it is my duty to arrest you’. On 7 October 1987, in Warsaw, Poland, on the day traditionally used to celebrate the creation of the Ministerstwa Spraw Wewnętrznych (Security Service of the Ministry of Internal Affairs), scores of young people gathered around the statue of Felix Dzerzhinsky to lay wreaths and chant exhortations of love for the secret police . Operating as the ‘Orange Alternative’, the participants carried posters, masks and banners proclaiming complete obedience and devotion to the figures of state authority. While participants demonstrated their appreciation towards these public servants ‘for doing their duty with a smile’ they distributed overly serious slogans that read, ‘We are For +!, Love the People’s Police!, Long Life to the Undercover Agents’. When the police did intervene, they were met not with opposition or violence, but by participants dutifully loading into police cars, kissing the officers, cleaning their boots, showering them in flowers and inviting them to play. 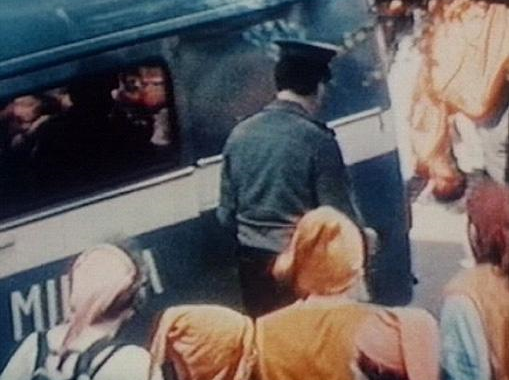 Through this action, just one example of many carried out in 1987-88, the Orange Alternative positioned themselves against the dialogue of traditional negative opposition. While Solidarity engaged in a language of ideological opposition, contra-state ideology, the Orange Alternative, through its claim to apoliticisation made by its founder Waldemar ‘Major’ Frydrych, presented a nonideological spectacular event. The analogy used in Vaclav Havel’s ‘The Power of the Powerless’ (1978) of the greengrocer is important in relation to the concept of nonideological ‘dissent’ within late-socialist (or as Havel designates post-totalitarian) society. Havel attempts to rationalise the reasons for the greengrocer to place the slogan ‘Workers of the World, Unite!’ in his shop window. He concludes that it is merely one of the many little details that affords him ‘a tranquil life in harmony with society’. It enables the greengrocer to hide behind the façade of ideology. Ideology, for Havel, offers the illusions of identity, whilst at the same time ‘making it easier to part with it’. The Orange Alternative’s nonideological action and positive affirmation/celebration of the apparatuses of state repression (police, a rigged voting system, censorship, propaganda) made it almost impossible to assimilate its actions into the discourse of open opposition. Ironically, as the Romanian artist Ion Grigorescu recalls, in some cases a certain level of dissention towards the state and its apparatuses of control, whilst still being persecuted, was expected. InPoland, as inRomania, criticism of both the party and regime had become so endemic it was almost totally pervasive at every level of society. The general state of cynicism permeated even the highest echelons of the party apparatchik creating a vacuum of any belief, at any level, in the ruling ideology or its rhetoric. Mass scale ‘private’ criticism of the regime, whether it be individually internalised and un-spoken or within the private sphere of the home, were acknowledge and monitored by the security services. Consequently, public displays of support were viewed with suspicion. Criticism, therefore, became a necessary component in the interplay between the state and its citizens and the construction of official discourse. The spontaneous and anarchistic actions of the Orange Alternative mirror Frydrych’s own ‘anti-hierarchical, meat-subversive, anti-leadership leadership style’, presenting the antithesis not only to the rigid authoritarian rule of the state authorities but also, and perhaps more importantly, the autocratic role of Lech Walęsa within the Solidarity movement. The central role of the Committee for the Defence of Workers (KOR) in the structural and strategic evolution of Solidarity points to the overriding influence of a top-down leadership (‘elite’) rather than a grass-roots mass activism. ‘KOR brought key concepts to the union such as demands for a free trade union, the inter-factory strike committees and the sit-in strike.’ It was the presence of these ‘enlightened elites’ that ‘brought ideas to workers who by their nature were unable to proceed beyond riots to voice ‘complicated’ political ideas. If this proves ‘Lenin’s concept of a victorious ‘vanguard leadership’, even [at the very time of] its defeat’, then it also provides an antithesis to the structure of Orange Alternative anti-hierarchical actions. The creation of these spectacular events by the Orange Alternative, which seek to reveal the State’s ‘obscene Super-ego’, comprise three distinct but simultaneously functioning components: actor, stage and story. Far from being dissident devices of anti-authoritarian performance, these three elements can be seen to have emerged within the Official framework of a specific state spectacle, the ‘theatricalisation of everyday life’ and the creation of mass reality. The Orange Alternative present the symbiotic relationship between these elements as a form of street theatre as ‘subversive spectacle’. Whilst the ‘Orange’ movement was based not on belongingness but on participation the inter-changeability of actors and non-actors provides the modus operandi of Orange Alternative spectacles. During a referendum on social policy conducted in Wrocław, the Orange Alternative publically called for the city to register a 200% voter turnout. Chanting the slogan “Vote Yes twice”, the ‘participants’ were soon joined by members of the public, either oblivious to the irony of the situation, fearful of reprisals or in genuine support. The police intervened and over 150 people were arrested. 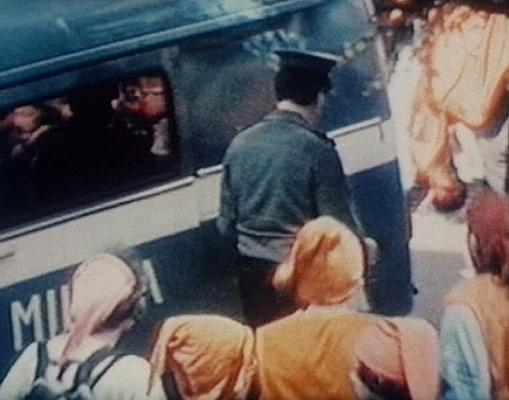 However, once detained, the authorities discovered those arrested comprised Orange Alternative ‘dissenters’ and ‘loyal’ members of the public. Being confronted with its own rhetoric, the regime was unable to distinguish between the two. Performing as the ultimate embodiment of obedience and subservience, the ‘actors’ not only identified the unique character of the ‘Polish-Communist-Citizen-Buffoon’ but also the latent contradictions within state authority. The happening was ‘completed’ by the authorities who barricaded the street and aided in distributing the scarce toilet paper to the gathering crowds. Cynicism has become so prevalent that even those who perpetuated state power do not believe in its version of reality. It serves no function other than to sustain its own existence. For Havel the greengrocer is as guilty in this complicit arrangement to preserve the repressive regime as the policemen. It is through the act of exposing this cynical state hypocrisy, that the Orange Alternative engage people, whether they chose to or not, to perform an act of dissention. For Miklós Haraszti this reciprocity is manifest in a uniquely socialist ‘master-slave relationship’ which saw artists and censors engaged in an act of mutually dependant signification. These staged hyper-obedience resistance tactics illustrate the possibility of the state to engage ‘voluntarily in a form of power-sharing with non-state actors’. This could be seen as a form of ‘theatrical’ neo-corporatism. The policy of ‘neo-corporatism’ as adopted by Solidarity, ‘offer[ed] the possibility for free trade in a Leninist state, whereby [Solidarity] might be ‘incorporated’ into the decision-making process, in exchange for offering tentative support to the regime, somewhat like the Polish Catholic Church’. From 1968 onwards the ultimate failure of opposition tactics throughout the Eastern Bloc to grasp state power directly through force, saw a change in towards the reconstructing of civil society and Solidarity’s own ‘self-limiting revolution’. However, while the neo-corporatist strategy was the only one capable of accommodating Solidarity within the dialogue of a Leninist state, this could equally represent the state’s attempt to neutralise the movement by ‘absorbing’ it into official party discourse. Dissent’s identification with a terminology of ‘the underground’ expresses an ideological and social position through spatial metaphor. However, the ‘underground’ is a complicated term in the context of the Polish artistic scene. State authorities had traditionally managed to de-politicise the artistic avant-garde not by censoring and thus radicalising it but by placating it through compromise. However, the actions of the Orange Alternative, are literally brought out from basements and secret meetings onto the street and into direct confrontation through extreme over-identification with the authorities. For Barbara Falk the Polish opposition since the formation of KOR had prided itself on its public face, its openness, its cultivation of civil society that existed alongside the party-state and not beneath or hidden from it’. While Solidarity was forced underground the Orange Alternative not only came face-to-face with the party-state, but they did so within the most self-evidentially ideological space where ‘collective identities of socialism were forged’. Banners were constructed and carried proclaiming support for Boris Yeltsin and demanding a an 8-hour work day for the secret police. Whilst the initial group performing the re-enactment had been an identifiable network of willing participants, the initial crowd of roughly 150 grew as passers-by and crowds began joining in and shouting Bolshevik slogans and calling for Revolution. The following day, to commemorate the anniversary of the Russian Revolution, over 10,000 people marched through Warsaw chanting ‘We Love Lenin’. This Revolution of Dwarves presented celebration and re-enactment as potentially dangerous sites, as the anti-hierarchical re-enactment of revolution by the Orange Alternative reveal these ceremonies as hollow rituals, a perverse simulacrum of official history. Re-Enactment of Revolution of Dwarfs, Wrocław, 1988. This mimetic, yet all the while playful, re-creation of revolution becomes therefore a dangerous activity which threatens a Totalitarian regime. The Orange Alternative attempt to ‘appropriate’ everyone into their spectacle, to a point where anyone can be a part of the action. As in Who is Afraid of Toilet Paper? and the celebration of the secret police, the Orange Alternative invest the official spectacle with carnival through which period people move from passive indifferent spectators to participants. The Orange Alternative hijack ‘everyday life in Poland, [which] is stigmatised by those endless celebrations of the grim past, grey present and hopeless future’. The Orange Alternative fight against what Solzhenitsyn and Havel describe as the ‘BIG LIE’ in the socialist public space/society. By presenting a totally inclusive antipolitics, the objective of dissident action groups such as the Orange Alternative within Poland, and the wider Eastern Bloc, ‘was not to defeat the ruling power but to progressively liberate society from its control’. For Havel, whether the greengrocer believes in the slogan or not is irrelevant. It is by focusing on the motivations which drive him to continue to display (and so endorse) the slogans of the regime long after they have lost any semblance of truth that Havel hopes to expose an area for dissention. Havel hypothesises as to the consequences were the greengrocer to remove his sign, to stop voting in elections and ultimately speak the truth. He has shattered the world of appearances, the fundamental pillar of the system. He has upset the power structure by tearing apart what holds it together. He has demonstrated that living a lie is living a lie. He has broken through the exalted façade of the system and exposed the real, base foundations of power. He has said that the emperor is naked. And because the emperor is in fact naked, something extremely dangerous has happened: by his action, the greengrocer has addressed the world. He has enabled everyone to peer behind the curtain. He has shown everyone that it is possible to live within the truth. Living within the lie can constitute the system only if it is universal. Through the hypothetical act of refusing to engage in the rituals of complicity, the greengrocer does not oppose communist authoritarian ideology with ‘anti-communist ideology… [he] opposes it by interacting within a framework that does not include ideology’. It is, therefore, the essential role of the Orange Alternative to confront the regime with its own rhetoric and in doing so reveal its ‘obscene’ ideology. By its extreme ‘hyper-obedient’ engagement with authority constituting ‘an alternative outside ideology’, the Orange Alternative demonstrates the lie that permeates the State. Havel’s greengrocer and the fictional Soviet policemen engage in the ritual of complicity. By ‘accepting appearances as reality’ they become players in the game, ‘making it possible for the game to go on’ thus sustaining the regime. The Orange Alternative force participants to become aware of this absurd space between official reality and the reality before their eyes. They play the game as fanatics but in so doing reveal the rules to be hollow, absurd and corrupt. Badovinac, Zdenka, (ed. ), 2000+ ArtEast Collection: The Art of Eastern Europe in Dialogue with the West – From the 1960s to the Present, exh. cat., Ljubljana: Moderna Galerija, 2000. Badovinac, Zdenka, ed. Body and the East: From the 1960s to the Present, exh. cat., Ljubljana: Moderna galerija Ljubljana, 1998. Epstein, Mikhail. N., After the Future: The Paradoxes of Postmodernism and Contemporary Russian Culture, trans. Anesa Miller-Pogacar, Amherst, Mass., University of Massachusetts Press, 1995. Falk, Barbara J., The Dilemmas of Dissidence in East-Central Europe: Citizen Intellectuals and Philosopher Kings, Budapest, New York: Central European Press, 2003. Gržinić Marina and Günther Heeg (eds) Mind the Map! History is not Given. Critical Anthology based on the Symposium (Frankfurt am Main: Revolver, 2006). Hoptman, Laura and Tomáš Pospiszyl eds., Primary Documents: A Sourcebook for Eastern and Central European Art since the 1950s, New York: Museum of Modern Art; MIT Press, 2002. IRWIN ed., Art East Map. Contemporary Art and Eastern Europe, Cambridge , Mass. ; London, UK: Afterall Books, MIT Press, 2006. Krauss, Rosalind, “A Voyage on the North Sea”: Art in the Age of the Post-Medium Condition, London: Thames & Hudson, 1999. Pejić, Bojana − Elliott, David (eds. ), After the Wall, Art and Culture in Post-Communist Europe, exh. cat., Stockholm: Moderna Museet, 1999. Piotrowski, Piotr In the Shadow of Yalta. Art and the Avant-garde in Eastern Europe 1945-1989, London: Reaktion Books, 2009, pp. 33-105. Solzhenitsyn, Alexander, Letter to Soviet Leaders (London, 1974). In 1987 the Orange Alternative organized :’The Parade of the Casseroles’ (April), ‘Gremlins in People’s Poland’ (June), ‘Away with the Heats’ (August), ‘Anti-War Manifesto’ (September), ‘Who is Afraid of Toilet Paper?, ‘The Day of Militiamen’, ‘Direct Action’, ‘The Day of the Army-Manoeuvres’, ‘Rockmelon in the Mayonnaise’, ‘Toilet Paper-the Second Edition’ (October), ‘Eve of the Revolution’, ‘Referendum-the Meeting of Support’ (November), ‘St. Nicholas’, ‘The Evening of Three Kings’, and ‘The Orange-Blue Toast’ (December). This is manifested in the evolving treatment of the Orange movement – ‘from totally neglecting and ignoring it as an opposition force in 1983-84, through criticising it for its alleged youthfulness or irreverence in 1986-87, ridiculing it as fool’s play in early 1988 and to persecution and state-sponsored aggression in late 1988’. Toilet paper inPoland was continuously in short supply and became an emblem of the shortages which permeated much ofPoland and the Eastern Bloc. Branchflower, Here & Now No.7/8, 1988.